AutoCAD Map 3D is model-based GIS and mapping software from Autodesk. The Map 3D functions are available for use in Civil 3D through the Map Task Pane. The Map 3D functions are very useful for adding aerial images or GIS shapefiles to your civil project. This can be done quite easily through the Data Connect window of the Map Task Pane in Civil 3D. 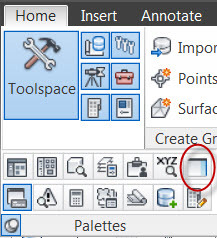 The Map Task Pane can be toggled on from the Palettes panel of the Home tab of the ribbon. Connecting to an aerial image, for instance, is easily done through the Map Task Pane. However, users may occasionally encounter a problem when trying to add the image to the “map” or drawing. 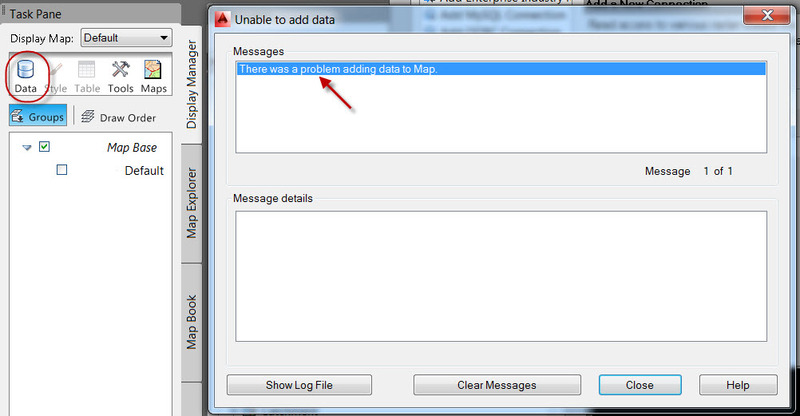 There will literally be an error message stating that there is a problem adding the data to the map. However, the error message does not mention the nature of the problem and that can make troubleshooting difficult. This is where my tip comes in! This usually involves folder permissions for wherever the temporary external reference location is set in the user profile options. If this folder has permissions or security restrictions set on it the data will not be loaded into the drawing. The default folder out-of-the-box from Autodesk is C:\Users\<username>\appdata\local\temp. However, custom profiles with company specific settings may differ. 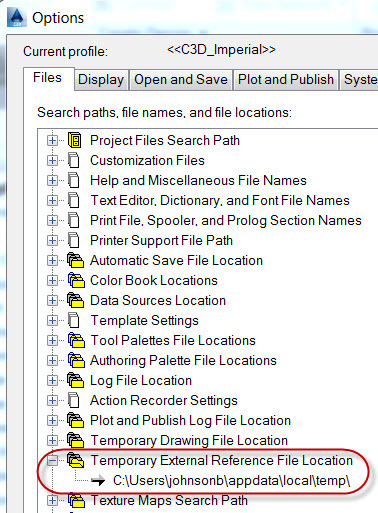 To find out which folder is being accessed when connecting to data via the Map Task Pane, type OP in the command line to bring up the Options dialog box. Click on the Files tab, and expand the Temporary External Reference File Location heading. Now, make sure to set full permissions for whichever folder is listed there, and chances are your data connection problems will be solved. dude thanx, i have been racking my brain on this all day. im good to go now and you stay cool.